The redesigned 2016 Chevrolet Malibu is now a fully competitive midsize sedan with the fuel economy, features and interior space to challenge the segment's best. The 2016 Malibu is fully redesigned. Spacious interior with tall-person-friendly front seats; refined ride quality; crisp and responsive 8-inch touchscreen; strong 2.0-liter turbocharged engine. While we didn't dislike the previous-generation Chevrolet Malibu, we were also not particularly enthralled with it, either. Compared to a number of recently refreshed or overhauled rivals, the Malibu simply failed to stand out. It had a comfortable ride and a strong available turbocharged engine, but its oddly cramped backseat and rental-fleet styling made it a forgettable entrant in this highly competitive segment. But for 2016 Chevrolet has gone back to the drawing board, and the result is the redesigned 2016 Malibu. The first thing you'll notice is the striking exterior styling. To some of our eyes, it even evokes the Audi A7 with its sleek faux-hatchback profile. In any case, it's safe to say this is the first Malibu since the early '70s that won't look out of place in the tony California seaside town for which it's named, particularly in Limited trim with the 19-inch wheels. A wallflower no more, the 2016 Chevrolet Malibu has become a striking car by family sedan standards. Chevy has tinkered under the hood as well. There's a newly standard turbocharged 1.5-liter four-cylinder engine that replaces the previous naturally aspirated 2.5-liter base engine. It gives up 36 horsepower compared to the old 2.5, but its turbocharged nature gives it suitable low-rpm oomph plus improved fuel economy. The Malibu's engine upgrade, a smooth and strong turbocharged 2.0-liter four-cylinder, remains optional for those who want more vigor, and it's been retuned and paired with a new eight-speed automatic transmission for better fuel economy. The outgoing Malibu wasn't exactly short on features, but the 2016 model certainly competes well in this segment in terms of standard and optional equipment. Interior materials have a premium feel and look, and the front seats offer plenty of adjustability, even for tall folks. Out back, the previous legroom shortage has been corrected thanks to a wheelbase that's nearly 4 inches longer, finally putting the Malibu on par with its primary competitors. So, is the Malibu the new family sedan favorite? We wouldn't go that far. The Honda Accord gets a makeover of its own this year, and it remains a very compelling car, especially in its value-packed lower trim levels. The Hyundai Sonata is another excellent all-around choice for the money. We also like to introduce shoppers to the underappreciated Mazda 6, which is a great choice for a car with a bit more style and athleticism. But if the 2016 Chevrolet Malibu ends up feeling right to you, you'll certainly be driving one of the finer sedans in this class. The 2016 Chevrolet Malibu midsize sedan is offered in four main trim levels: L, LS, LT and Premier. Note that the LT is technically divided into two sub-trims (1LT and 2LT), with the latter receiving the 2.0-liter engine, the eight-speed automatic transmission and a few other features noted below. The base L comes standard with 16-inch steel wheels, keyless entry and ignition, cruise control, air-conditioning, a tilt-and-telescoping steering wheel, cloth upholstery, manual front-seat height adjusters, a 60/40-split folding rear seat, OnStar, Bluetooth phone connectivity and a six-speaker audio system. The LS adds 16-inch alloy wheels, automatic headlights, 4G LTE connectivity with mobile WiFi, a rearview camera, Bluetooth streaming audio and the MyLink infotainment system with a 7-inch touchscreen that includes Android Auto and Apple CarPlay smartphone integration. Although the base L trim isn't particularly well equipped, the higher trim levels raise their game with up-to-date features and even a two-tone color scheme. The 1LT gets 17-inch wheels, LED daytime running lights, heated mirrors, ambient interior lighting, an eight-way power driver seat (with power lumbar), rear climate vents and satellite radio. The 2LT is generally comparable to the 1LT but adds the powertrain upgrade, 18-inch wheels, dual exhaust tips and a larger fuel tank (15.8 gallons versus 13.0 for the 1.5T). The Premier boasts 19-inch wheels, LED taillights, remote ignition, a color driver information system, an auto-dimming rearview mirror, leather upholstery, heated and ventilated front seats, driver memory settings, a six-way power passenger seat (with power lumbar), a heated steering wheel, dual-zone automatic climate control, wireless smartphone charging, a 120-volt power outlet, two additional USB charging ports, an upgraded 8-inch touchscreen, a navigation system and a nine-speaker Bose audio system. Some of the higher-end standard features are available on lower trim levels as options. Other options, depending on trim, include a sunroof, 18-inch alloy wheels and a couple of advanced safety-related packages (see Safety section, below). All 2016 Chevrolet Malibu models are front-wheel drive. The L, LS and 1LT trim levels come standard with a six-speed automatic transmission and a turbocharged 1.5-liter four-cylinder engine rated at 160 hp and 184 pound-feet of torque. Fuel economy is EPA-rated at 31 mpg combined (27 city/37 highway), boosted slightly by a stop-start system that automatically turns off the engine when the car comes to a halt. You can tell the 2016 Chevrolet Malibu Limited by its propeller-style 19-inch wheels. Also, the powerful 2.0-liter turbo engine comes standard. Standard on the 2LT and Premier trims are an eight-speed automatic and a 2.0-liter turbocharged four-cylinder that cranks out 250 hp and 260 lb-ft of torque. That's less output than this engine made in the previous Malibu, but the new eight-speed transmission makes the most of it and also contributes to improved fuel economy estimates of 26 mpg combined (22 city/33 highway). 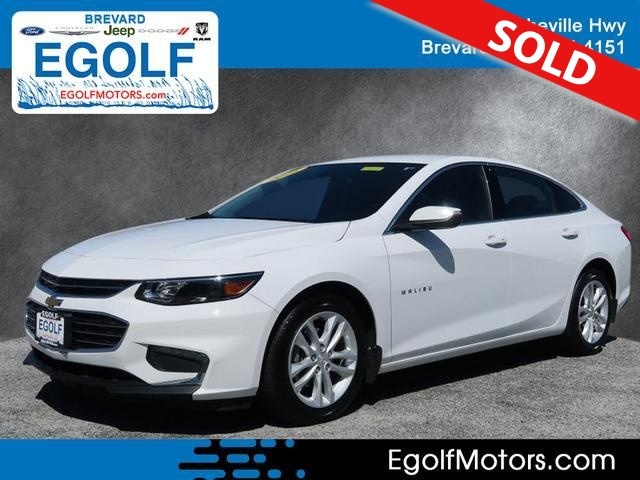 The 2016 Chevy Malibu comes standard with antilock brakes, stability and traction control, front knee airbags, front side airbags, rear side airbags and side curtain airbags. Also standard is the OnStar telematics system, which includes automatic crash notification, on-demand roadside assistance, remote door unlocking and stolen vehicle assistance. A rearview camera is standard from the LS trim on up, and there are two advanced safety packages. The Driver Confidence package adds automatic high-beam headlight control, front and rear parking sensors, a blind-spot monitor, rear cross-traffic alert, lane-departure warning and intervention, and a forward collision warning system with low-speed automatic braking. The Driver Confidence II package adds a self-parking system, an electronic parking brake, adaptive cruise control and an upgraded collision mitigation system with automatic emergency braking. While the 2016 Chevrolet Malibu is much sleeker than its predecessor on the outside, it takes a more evolutionary approach inside. That's fine with us, as we generally praised last year's Malibu for its attractive and well-appointed cabin. What jumps out about the new dashboard is its understated gauge cluster, for one thing, replacing the old deeply hooded cluster that employed individual pods for the tachometer and speedometer. The gauges themselves also have a more modern look, and the climate controls likewise show a bit more flair. Another welcome touch is the way in which the optional MyLink touchscreen is integrated: It looks like an iPad slipped neatly into its own slot, bucking the trend these days of infotainment screens perched awkwardly atop the dash. The 2016 Malibu's optional 8-inch MyLink touchscreen is user-friendly, and we like how it appears to slot into the dashboard like an accessory iPad. Speaking of those touchscreens, the lower-end unit has a 7-inch diagonal with merely adequate graphics, while the available 8-inch screen (standard on Premier, optional on LT) offers tablet-like colors and clarity. We like the intuitive menu structure, and the quick response times mark a clear improvement over the previous Malibu's interface, which we dinged for its sluggishness. Also notable are cool features like mobile 4G WiFi and full smartphone integration via Apple CarPlay and Android Auto. It's unfortunate, however, that the base L trim comes standard with neither of these infotainment systems; the Accord, for example, gets a crisp and responsive 7.7-inch screen even in base LX form. Seat comfort is a strong point in the 2016 Malibu. The power driver seat (we haven't tested the manual version) slides back farther than the Accord's, making this Chevy a strong pick for tall shoppers, and all front-row riders will likely find support and cushioning to be satisfactory. In back, the new Malibu's elongated wheelbase opens up enough legroom to challenge rivals like the Ford Fusion, though in our experience, the Accord and Sonata offer even more. Still, the Malibu is now competitive in terms of backseat space, and that addresses a major complaint about the previous-generation car. The Malibu's trunk measures 15.8 cubic feet, which is an average figure for a midsize sedan. The 1.5-liter turbo engine might have enough pep for your taste, and it might not. For the record, 160 hp is about as meager as it gets in this segment, so don't expect a stirring experience when you mat the gas, even though the new Malibu is nearly 300 pounds lighter than its predecessor per GM's scales. On the other hand, the ample turbocharged torque hits early and often, so when you're climbing a hill or simply keeping up with traffic, this engine can feel virtually effortless. Overall, we'd say it's just fine for most purposes, but if you're underwhelmed on your test-drive, be sure to check out the energetic 2.0-liter turbo, which makes the Malibu a much quicker car and also brings the more confident eight-speed transmission. The 2016 Malibu's styling hints at a certain sportiness within, and sure enough, this model feels more athletic on the road than its stolid predecessor. We occasionally noticed intrusive road noise in the 2016 Malibu, which may be a function of its significant weight loss; last year's heavier model stood out as a paragon of serenity at speed. Nonetheless, the new Malibu is a quiet car on the whole, and it also feels lighter on its feet, with a newfound nimbleness that makes it at least mildly entertaining to drive. Ride quality remains a Malibu strength, with most bumps and ruts getting expertly filtered out before they reach the cabin.